A couple of years back when Richard Wagamese's Indian Horse was a contender on CBC Radio's Canada Reads, I was shocked to hear some listeners remark that they were thankful to have been exposed to the book because they hadn't heard of residential schools before. I hadn't heard of them growing up and would be hard pressed to say when they first crossed my radar. I don't think it was during my undergrad, but maybe. I moved north in 01, and I certainly heard about them then. And since then it's been such a common thread in public discourse in the north that I guess I took for granted that people in the southern provinces must have heard of residential schools and their controversial legacy by now. In any case, books such as Indian Horse and Fatty Legs are certainly important in educating the larger public and in making sure the history is told so that we can all learn from those mistakes and heal. Fatty Legs, unlike Indian Horse, is non-fiction and aimed at a younger audience. These are the memoirs of Margaret Pokiak-Fenton, who co-authored the book with her daughter-in-law, Christy Jordan-Fenton, about her first year away from her home on Banks Island in Canada's high arctic to a Catholic-run residential school, located a five day schooner ride away in Aklavik. When she left she was known as Olemaun, but the nuns changed her name to Margaret. It's told in the past tense, clearly from an adult recalling her experiences, but the voice is mostly kept innocent and childlike which lends the book more immediacy and empathy. It felt almost as if I was experiencing these things for the first time right alongside her, not chatting with the adult Margaret. It was simple, but powerful in its way. It doesn't delve into some of the more horrific stories I've heard from other residential school stories and reports, but there's still a pervading sadness. However, and perhaps most importantly, there's also hope. Margaret has an infectious personality. She insists on being allowed to go to the school, and finally her father seems to feel he has no choice but relent. She is headstrong, or stubborn some might say, and I guess he feels that she maybe she needs to learn for herself. But it's this stubbornness that manifests itself as a positive trait, resiliency, that pulls her through. But in its short space of just 104 pages, Fatty Legs has more than a few lessons to teach-- and some lessons, like the one above are relevant regardless of one's race or experience with residential schools. Another example: I've heard a lot of people talk about how kids today have no respect for authority. This is a way of saying that kids of yesterday were better behaved and did as they were told. Margaret was constantly being bullied by a nun whom she nicknamed "the Raven." However, as Margaret proved, while simultaneously destroying the myth that kids of the past all blindly obeyed, sometimes authority needs to be questioned. 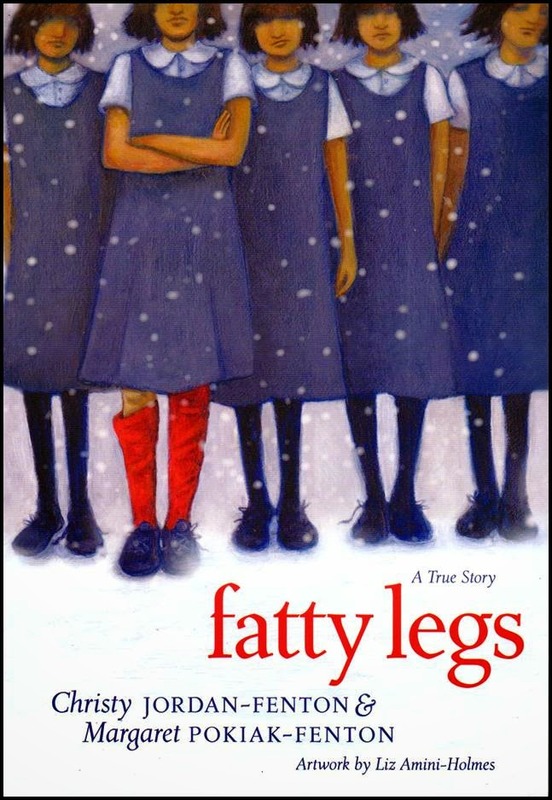 Fatty Legs is illustrated beautifully, and poignantly, by Liz Amini-Holmes.